I have let this blog lay bare for quite a while now. I had a variety of reasons. Most of them were of a personal nature – thus, I’d rather not go into them here – and the need to focus my limited energy on other things. For what it’s worth, I’ve been at the receiving end of a lot of kindness and forgiveness and things are looking up again. So, here I am after I spent the day in turns staring at the screen where I am trying to finish an article and at the pages of the draft that I have printed out. In the breaks I’ve caught up on the story of Ikorodu mosque in Lagos and the images of the sheikhs Ahmad Tijani al-Hasani, Ibrahim Niass and Jami’u Bulala. It’s a fascinating story whatever your take on what the images actually depict and how they got where they are. Or at least it is for me. What people make of images and how they relate to them is infinitely fascinating to me. The story doesn’t fit into anything I am currently writing and I am not in Nigeria to find out what exactly local worshippers make of these images. So, what to do with that story? Hold on, I thought, I used to blog about that sort of thing, didn’t I? So, I guess it’s time to revive this blog. My research interests have shifted somewhat since I last published a post here – and, I think the blog will have to reflect that in future. You will have to trust me that all of this will eventually relate back to northern Nigeria – and, if not northern Nigeria, at least West Africa. In Allah ya yarda, it will lead me and my research back to northern Nigeria. In the meantime … well, there are archives to visit, images to be related back to contexts of ideas and practices and all kinds of other connections to be made. And, all of this needs to be published bit by bit. To be completely honest, I am not quite sure yet how this well translate into the blog and how often I will find the time, energy and material to blog. But, here we go, trying to revive the beast. 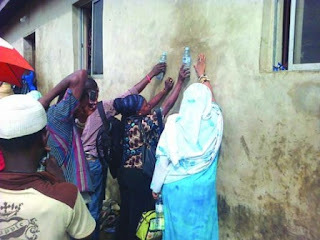 So, the news that images of the sheikhs Ahmad Tijani al-Hasani, Ibrahim Niass and Jami’u Bulala emerged on the walls of a mosque in Lagos already broke five days ago. As most of the time, it took me a little longer to catch up on it. Twitter is finally good for something. 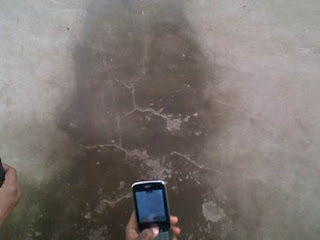 Reportedly, somebody tried to wash of the image but unsuccessfully. According to the Vanguard’s eyewitness ‘the more they [tried] to rub it off, the more the images become [sic] clearer’. Since the news spread the mosque has attracted ‘thousands of people,’ according to the Vanguard, having become a ‘Mecca of sorts. ’The newspaper suggests that people visit the mosque for a variety of reasons that range from mere curiosity to piety and in particular the wish to offer prayers. 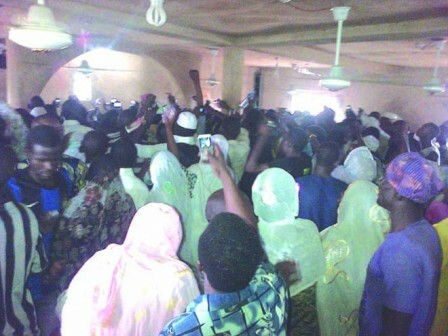 It reports repeated chants of ‘Allahu Akbar’ (at least that’s what I think they mean, they transliterate the chants as ‘Allah Hakibaru’ [sic], which they translate as ‘Allah is the greatest’) and that many visitors carry prayer beads and Qur’ans. 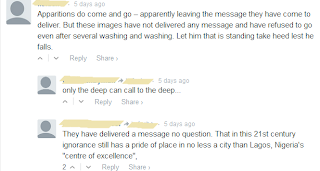 There are even reports that the images inspired some visitors to convert to Islam. The photos that accompany the Vanguard report suggest that visitors are eager to photograph the appearances. The article also notes that traders in the vicinity of the mosque seized the opportunity and started selling photographs of the images for N100 per piece. Curiously, considering the attention these images have generated very few photographs can be found in the articles and across the internet. Among those, only one seems to suggest an actual portrait of a sheikh to me. Admittedly, my perspective here is that of an art historian or anthropologist. I believe this requires me to adopt an agnostic perspective here that is open to the possibility that these images may be or may not be divine and that my own agnosticism affects my ability to recognise what a believer sees. In other words, I am not looking at those images with the eyes of the believer. So, what do I know? 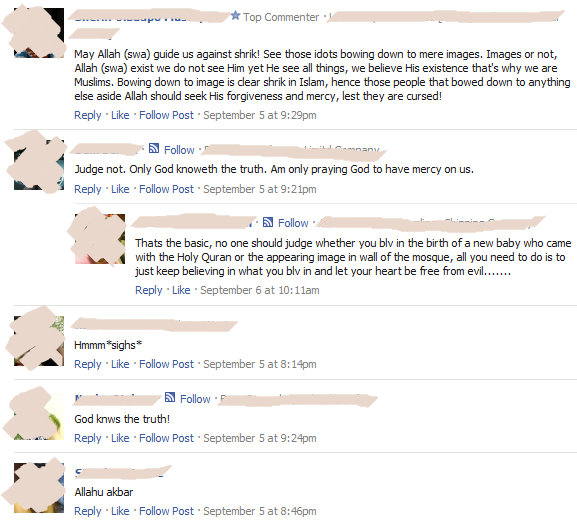 I am, however, curious what regular worshippers at the mosque and current spectators make of these images. 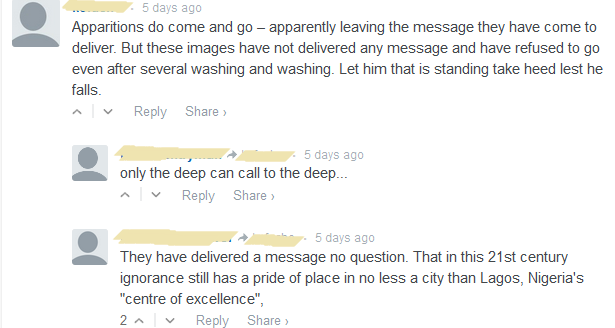 Ideally, I’d love to talk to them but since I am in London I only had a quick look at the comments below the articles. The emphasis here is on quick. I don’t have the time for an in-depth analysis. I took the time to cover up the names and faces of all the people whose comments I reproduce though. 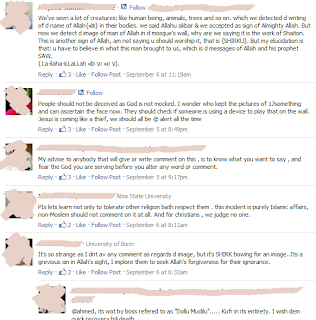 They commented online, yes, but they didn't sign up for these comments to be incorporated into my blog. So, I think that's appropriate. These are some of the trends I noticed. One thing, however, immediately caught my eye. Reportedly these images do inspire practices of visual piety on the ground and at least the articles that I have read do not quote any scholarly criticism of the worshippers neither from a Muslim nor a Christian perspective. And, there are some supportive messages on the boards as well. 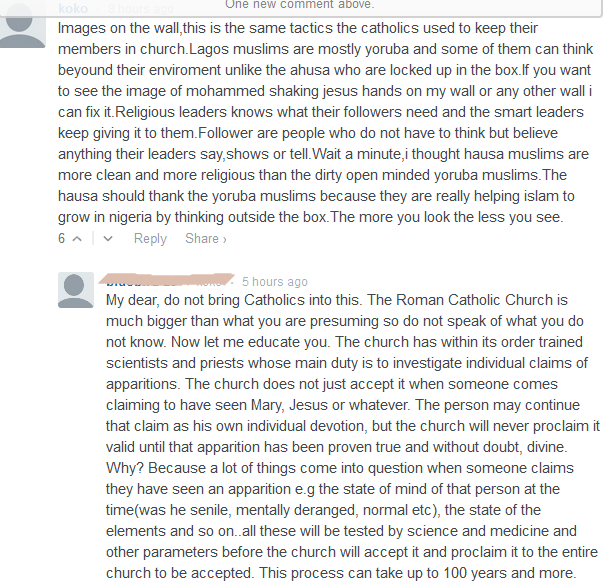 The message boards, however, abound with pious criticism of these practices by Nigerian Muslims. 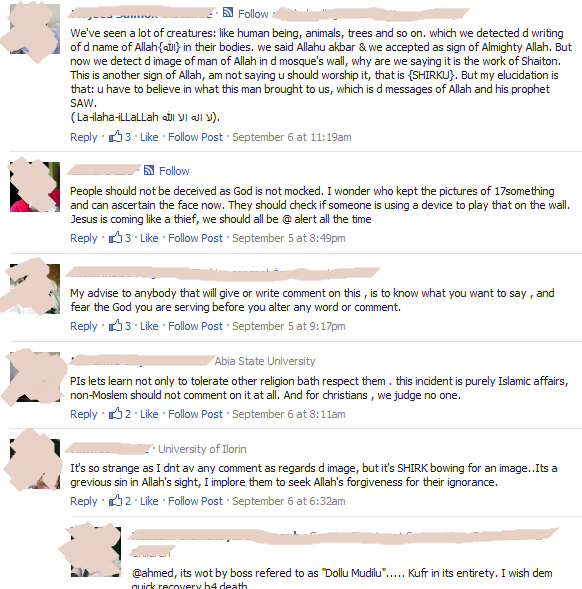 They identify in these practices shirk and in particular idol worship. I wonder to which extent these differences in opinion reflect differences in education - and thus access to social media - and/or different approaches to visual piety. For me, that image is not real and it’s an evil imagination. Because the Bible says Jesus will come down with the Holy Saints and Prophet at the last day. And I will advice those clerics to stop deceiving people because I don’t understand what that means and I have not seen such before. I don't seem to find a similar quote in the comment pages. Speaking of Christianity, one commenter actually drew parallels with the recognition of some appearances of Mary in the Catholic Church. Curious, I thought. Including the response. And then, of course, there are comments that identify in the appearance of the images fraud. Finally, there was … well, I’m not in the mood to mince my words: hate speech. 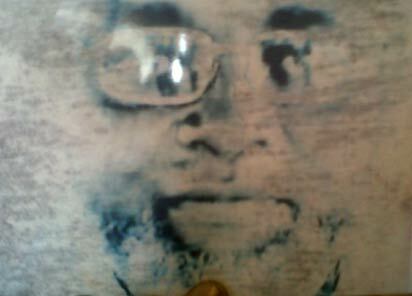 The mention of Boko Haram and equation of Islam with terrorism were sadly to be expected. 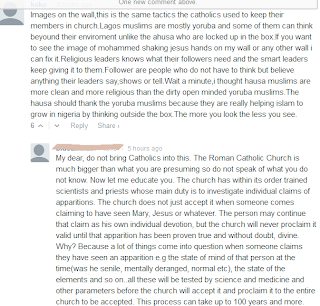 What surprised me was the anger directed at Yorubas and Yoruba Muslims in particular. It’s sad to see how divided the country is – even in response to what is actually a rather apolitical story! I've decided not to reproduce any of those.